Weavers Way Walking RouteWeavers Way is a 56 mile walking route from Cromer to Great Yarmouth passing through Hanworth, Blickling, Aylsham, Acle and Halvergate. The name Waeavers Way comes from the cloth industry that was once a major industry in the area, leaving its mark with extraordinarily grand churches and historic country manor houses. Directions to start:The walk starts from the pier of the delightful seaside town of Cromer. The town was first mentioned in 1262 as a port known for crab fishing (for which it is still famous) and became a fashionable health resort by the time of the eighteenth century. Distance from nearest train station (please name station): Cromer. 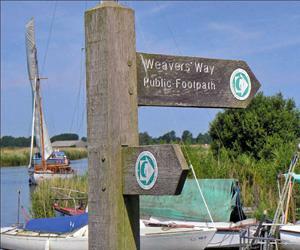 Weavers Way is a 56 mile walking route from Cromer to Great Yarmouth passing through Hanworth, Blickling, Aylsham, Acle and Halvergate. The name Waeavers Way comes from the cloth industry that was once a major industry in the area, leaving its mark with extraordinarily grand churches and historic country manor houses. Points of interest: Cromer, Great Yarmouth, Blickling Hall.